GPS instruments come in two broad categories. Consumer grade like the Garmin hand held devices and high end smart phones that have a broad accuracy of 3 to 5 metres, and professional grade instruments that can be accurate to a centimeter or two. They are totally different beasts but both are useful instruments as long as you realise their respective limitations. It is very likely that in the next few years you will see high end smart phones and consumer grade GPS's improve their accuracy to sub metre levels. It is helpful to look at accuracy especially when using a consumer grade GPS or a smart phone GPS. If you carefully measure a rectangular house foundation walls on two successive days and map the results you are very likely to get a map like this: As you can see, the shape of foundation is consistent but the position within the maps grid lines has varied. That is the relative accuracy of a succession of GPS measurements is good but map accuracy is relatively poor. Secondly, to obtain the best possible data from consumer grade instruments I have found that it is important to standardise how you make the readings. a. Batteries: always use fresh fully charged batteries. Replace them when they are half used. Use high capacity rechargeable batteries like AA batteries 3000mAh. In my experience at some point as the battery becomes exhausted waypoint accuracy can be significantly affected. b. Turn your GPS on 5 to 10 minutes before starting to survey. c. Always start a new survey day by deleting all previous data from your GPS. d. Having set the GPS to use feet rather than metres, the Accuracy value displayed on the Map page is in feet rather than metres. This gives you a better indication on how well the GPS is performing whilst you are taking measurements, as the number range displayed has more increments (e.g. 3-6 metres has 4 increments, whereas in feet the equivalent is 10 to 20 or 11 increments). e. Display the GPS map page zoomed in to the maximum setting (e.g. 20 feet on the Garmin GPSmap 60CSx). At maximum zoom the small arrow in the middle of the screen is at its most sensitive; so you can observe small movements in the arrow which should stabilise before a waypoint measurement is made. f. When making waypoint measurements always have the Map page displayed and constantly monitor the Accuracy value. Typically in good conditions it will be between 10 and 20 feet (usually less than 16 feet). Above 20 feet consider using an external aerial - the Garmin GPSMap 60CSx has an external aerial input socket. g. Make at least 10+ waypoints around the boundary of small features (less than 5m diameter). More measurements are always better than less. When features have been identified using small flags, always consider what it will be like drawing the feature. Take as many measurements in-between flags as necessary and particularly so around curved features. h. Always hold the GPS upright at chest height whilst taking measurements. Always walk between measurement points holding the GPS in this position. If you have to put the GPS down or in a pocket, always hold it upright and at chest height for 20 seconds (or more) before making a waypoint measurement, and only then when the central arrow has stabilised. i. Before taking each waypoint measurement, watch the map indicator arrow on the GPS unit (at maximum zoom in) until it has settled down, usually about 5-10 seconds if you have kept the GPS upright at chest height between measurements. j. The most likely cause of inaccurate measurements is rushing. Take your time and make sure the GPS has stabilised before taking each reading. It is quicker to give the GPS an extra few seconds to stabilise in-between readings than to have to repeat the measurements on another day. k. There is one exception to the previous point. If you are taking waypoint measurements along a straight linear feature like a straight bank or fence-line, then I have found that if the first and last waypoints are measured normally, if you walk a straight path along the feature, then you can take a reading every few paces without stopping. l. When measuring significant banks or lynchets, then take measurements on the top of the bank or lynchet where the break of slope occurs, and again at the foot of the bank or lynchet where the ground levels out. When mapping these features you then know how long to make the hachures when drawing your map. m. Keep a written Log of the waypoints and description of what you are measuring. n. Draw a plan view in the log so this can be compared with the waypoint data plot. Record relevant details like the contours of the feature. These rules do not apply to professional grade GPS instruments although j take your time is still good advice. Whilst these instruments currently have significant more accuracy when you look at the raw (uncorrected) coordinate data, the accuracy described in the introduction is only achieved after correction of that data. To get an idea on how they improve map accuracy take a look at the map below. If you click the map, the webpage will open in a new window so that you can then tab between the two windows as you continue reading. The webpage that opens is the Ordnance Survey OS Net Rinex Data. If you scroll down a little and look at the map you will see that you can zoom into the North Pennine area which you will see the locations of OS Net GPS reference receivers fairly evenly spaced throughout the UK. Our local receivers are at Carlisle, Wearhead, Shap and Catterick Garrison. If you click on the accuracy statement at the top of the screen you see this statement: The standard errors of OS Net base station coordinates are generally better than 0.008 m in plan and 0.020 m in height. The GPS satellites that provide the data will be a mix of American, Russian and eventually European satellites. To remain useful the agencies that control their respective satellites have to continually adjust their orbits and keep them calibrated, but inaccuracies still occur. The OS Net reference stations are high grade GPS units permanently fixed on suitable buildings that have an open aspect to see all the satellites. They all are obviously of known latitude, longitude and height above mean sea level. Each station then compares its 'GPS' location with its known location and calculates a correct factor for that reading. This is done every second. Most commercial users buy a license to be able to receive the 'real-time' data corrections via the cell phone network. Alternatively, the data corrections can be made retrospectively by downloading the data via the Internet. The cost of the 'real-time' data correction license is usually too high for community voluntary groups, but there is a free version. If you view the OS Net page again you can complete the form beside the map and download the correction data from the closest reference stations for the survey's time period (GMT). This data however is not one second corrections but one minute corrections. In AA's recent excavations at Well Head, Holwick, we have borrowed a professional grade GPS from SWAAG and used the one minute correction data to create the trench maps in QGIS. Unfortunately when you get into GPS, Maps and GIS systems you need a basic understanding of a number of facts that appear as abbreviations, coupled with an awareness of their limitations. Starting with British National Grid (BNG) and latitude and longitude as used by Google Earth which uses the World Geodetic System 1984 (WGS84) as a geodetic datum featuring coordinates that change with time (continental drift). WGS84 is defined and maintained by the United States National Geospatial-Intelligence Agency (NGA). It is consistent, to about 1cm, with the International Terrestrial Reference Frame which allows for the Earth's crust moving due to plate tectonics, regional subsistence and various celestial effects. With WGS84 the height datum is based on the height above the centre of the Earth, where as the BNG is based the ODN (Ordnance Datum Newlyn), defined as the Mean Sea Level at Newlyn in Cornwall between 1915 and 1921. The British National Grid is also referred to as: BNG = OSGB 36 = EPSG:27700 [You will see this when working with GIS software]. The European Terrestrial Reference System 1989 (ETRS89) is a Cartesian reference frame, in which the Eurasian Plate as a whole is static. 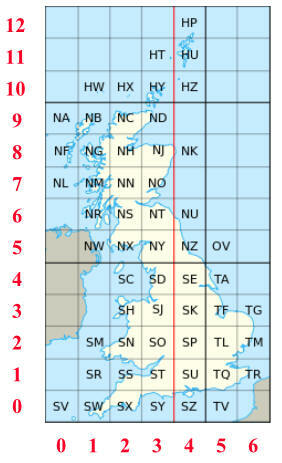 The coordinates and maps in Europe based on ETRS89 are therefore not subject to change due to the continental drift. 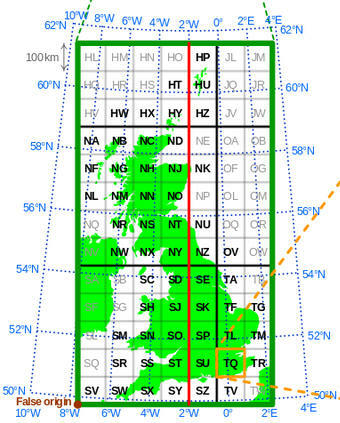 Most will have seen both maps displaying latitude and longitude and when it comes to the UK the Ordnance Survey (OS) British National Grid (BNG) coordinate system in the form of two letters followed by up to 10 digits. Lets look at the centre of the ford over the River Wear at Stanhope. On the OS 1:25000 map and on Google Earth. 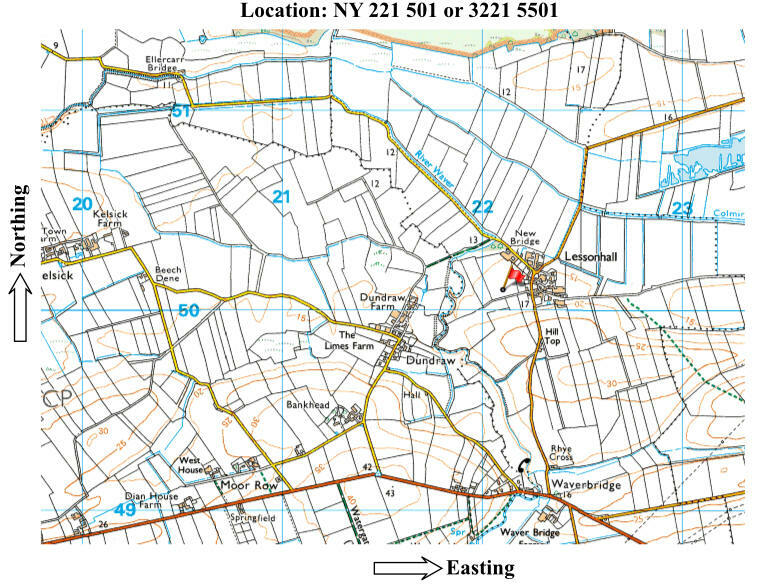 The OS map gives the position and altitude as NY 99100 39188 at 199m, whilst Google Earth gives: 54° 44' 51.40" N 2° 00' 55.80" W at 203m. This OS webpage enables you to transform BNG to latitude and longitude. When you do that you get: 54° 44' 51.65" N 2° 00' 55.84" W at 249m. The first diagram (below left) demonstrates that the regular square BNG when superimposed over latitude and longitude gridlines. There is a non-linear relationship between the two as you go from south to north. It is obvious that when converting a BNG coordinates to latitude and longitude or vice versa, then the algorithm must take this into account. So there cannot be a single accurate conversion factor. With the above information lets look at the conversion of coordinates to and from BNG and WGS84. This happens often and frequently in the background. GPS instruments record locations in WGS84 being the worldwide standard system, but here in the UK we set GPS instruments to display BNG. Consumer grade GPS instruments generally offer OSGB 36 conversion which is a single Helmert transformation. This transformation should not be used for data that requires better than 5m accuracy. As we know published archaeology reports generally report features with centimetre levels of accuracy. To do that they use professional grade instruments and software that uses other conversion systems. Methods for improving accuracy include a series of 'local transformations' depending on the northing rather than the single Helmert transformation, or a more complex transformation that model the distortion that is required. OSTN02 is a common example that is used. OSNT02 dates back to 2001/2 and has been used on all Altogether Archaeology's GPS data measured by SWAAG's Promark 120 GPS. In 2015 OSTN02 was updated and issued as OSTN15. The difference in accuracy between OSTN02 and OSTN15 is small, in the order of less than -10mm to +21mm depending on the location. For community groups using a single rover GPS and using the 1 minute correction data, then the use of OSTN15 is rather academic as their data is already significantly less accurate than that. For most landscape surveys and tying trenches positions into site maps, you do not really need to have 1cm accuracy levels generated by real time kinetic (RTK) GPS measurements. The Promark 120 GPS generally produces GPS measurements with indicated accuracy measurements od 20-30cm which usually reduces after correction with 1minute correction data to 10-20cm. The one minute correction data is usually downloadable approximately 2-3 hours after the last survey measurement. How you process the GPS data will depend on the software that you bought with your GPS. Whilst surveying keep a log of what has been measured and where appropriate take photographs. Processing will generally involve connecting successive individual coordinates with straight lines to produce an outline of the feature. This can be done within the GPS processing software or at a later stage using other consumer type software for processing GPS data like GPS Utility which is available at modest cost. GPSU is good at converting GPS data from one file type to another too. To import the GPS data into QGIS then several file types can be used. I tend to use .gpx.